Instagram: @coremidleton for all flash offers & competitions! 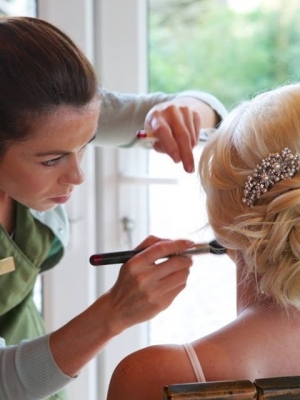 Exclusive Personalised Make up and Nail treatments for your wedding day. Having the right dress & the right hair is just part of the equation. Having the right make up application is also critical on your wedding day. The right shades, finishes & techniques are what go together to create a superb wedding day look. From sparkling glamourous to golden and natural , if you are a bride to be we invite you to be inspired. You will be photographed more on this day than any other day in your life. You'll be the centre of attention - Guaranteed! You probably know the most popular saying heard at a wedding is "Congratulations!" , but running a close second is " You look so beautiful!" . We want you to glow on your wedding day and we will help you every step of the way . Your makeup is an integral part of your wedding experience and we work very hard to create an enjoyable and unique experience for you and your Ladies that will set the tone for a wonderful day ahead. Our make up trial and in depth consultation will determine the right look and make-up to suit you and your party. With an eye to detail we ensure that your bridal goals are agreed in advance to ensure your make up and nails are exactly as you imagined. 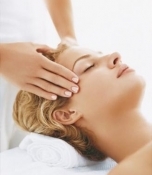 We offer treatment in our salon or we can travel to your home or hotel on the morning of your wedding. 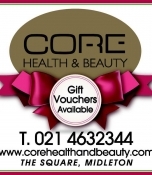 Please see our facebook page 'Core Health & Beauty' for some pictures of our recent brides or call into our salon to see our Bridal Make Up portfolio and all the lovely "Thank You" cards from past brides. Testimonials from recent brides are also shown below on this page. We confirm all wedding bookings via email so please contact us at corehealthandbeauty@gmail.com regarding availability or any questions you may have. Current prices and frequently asked questions can be viewed/downloaded on the Core Wedding Information attachment below . The Square, Coach Horse Lane, Main Street, Midleton, Co. Cork.